Oregon launched its statewide chronic absenteeism plan last December , in hopes of curtailing a growing problem in the state’s public schools. Ten months later, the problem is worse than it was in 2016. In 2016, about 18.7 percent of Oregon students were chronically absent, meaning they missed at least 10 percent of the 2015–16 school year. In 2017, that chronic absenteeism rate went up to 19.7 percent. The head of the Oregon Department of Education, acting deputy superintendent of public instruction Colt Gill, said there’s a real risk to students missing too much school. There is a consistent grade-by-grade pattern to attendance and absenteeism. Kindergarteners are a little more likely to miss school than the state as a whole: 20.7 percent of Oregon’s youngest students missed at least one day every two weeks last school year. 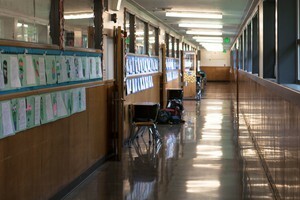 Then Oregon’s attendance rates generally improve from first grade through fifth grade. After that, chronic absenteeism becomes a bigger and bigger problem, every year. Regular attendance is worst by far for high school seniors — 37.6 percent of whom are chronically absent. That increased from 2016 when that label applied to 36.3 percent of seniors. At some school districts, the high school rates are a bigger problem than for the state as a whole. Portland Public Schools’ chronic absence rate for 12th-graders is just shy of 42 percent, though its overall level of chronic absenteeism across all grade levels — 17.2 percent — is better than the state average. PPS’ absenteeism rates are also better than the state average for freshmen, sophomores and juniors — and then worsen significantly for seniors. Officials at two different Oregon school districts noted that senior year is different because some students are already looking ahead to the future. Some students are cruising toward graduation with all the credits they need and aren’t as motivated to show up to school every day. Other students are on their way to dropping out or have their eyes on getting an equivalency diploma, landing a job or joining the military, rather than finishing senior year. Still, the high rates of absenteeism are raising alarm bells in some parts of Oregon. Salem-Keizer, Oregon’s second-largest school district, has a chronic absenteeism rate of 27.9 percent — well above the state average. More than half of the district’s high school seniors missed more than ten percent of 12th grade. “This is a major concern for us, and these findings will be used to guide a real shift in our engagement moving forward,” said Lillian Govus, the director of community relations and communications for Salem-Keizer Public Schools. But Govus pointed out that senior year is more complicated to analyze. She said Salem’s high school schedule makes it easy for students to accumulate credits ahead of time, allowing some seniors to basically have all the credits they need to graduate before 12th grade even starts.